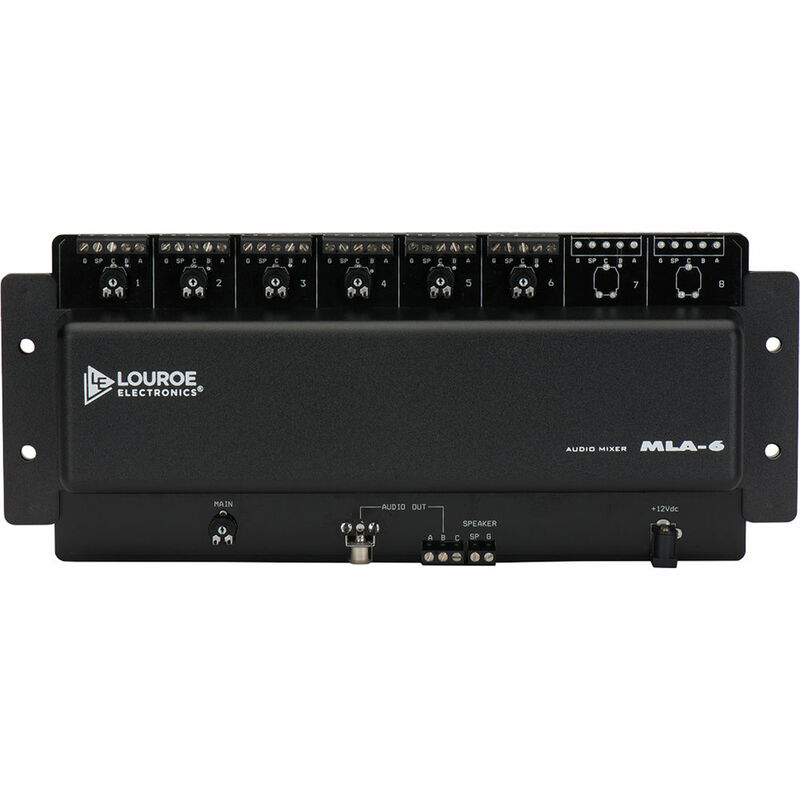 The Louroe MLA-6 Microphone Audio Mixer features 6 audio inputs and 1 audio output. This microphone audio mixer is designed to combine up to 6 microphones or up to 4 speaker/microphones to expand the listening area of an audio zone. The microphone mixer is located between the microphones or speaker/microphones and the Louroe base station. It has a line driver amplifier that allows for runs up to 5,000’ (1524m) between the microphone mixer and the Louroe base station, and up to 1,000’ (304.8m) between the MLA-6 microphone audio mixer and the remote microphone or speaker and microphone, for a total of 6000’ (1828.8m). The MLA-6 is a mixer designed for zone expansion only and is not a base station. It combines up to 6 microphones or 4 speaker/microphones to create a larger monitoring zone. If the cable run between the MLA-6 microphone audio mixer and the Louroe base station is less than 1,000' (304.8m), then the microphone mixer is phantom powered from the Louroe base station. If the cable run is between 1,000' (304.8m) and 5,000' (1524m), then the power required at the MLA-6 microphone mixer is 12VDC, 300mA. Note: When this equipment is used as part of an audio monitoring system, the law requires that public be given notice of audio monitoring on the premises. A decal stating AUDIO MONITORING ON THESE PREMISES (provided by Louroe Electronics) must be displayed in a visible location at the entrances and exits of both private and public buildings and vehicles. Wiring Microphone Only: 2-conductor shielded cable, 22 gauge with a 24 gauge drain wire. Unshielded cable is not satisfactory for audio systems.